It isn’t Christmas for me without Moravian Sugar Cakes. I first shared the recipe on Stella Ex-Libris’s blog a few years ago, the real from-scratch-with-mashed-potatoes-to-keep-it-moist recipe. However…I always cheat. So did my mom. And my grandmother, who actually WAS a Moravian. (As I understand it, the Moravians were a small sect that split off from Catholicism before the Protestant Reformation. They settled in Winston Salem, NC, and, mysteriously, Hope, IN, which is where my grandmother lived.) I always bake a few of these, and then we have a Christmas morning pajama party with the neighbors! I use Pillsbury Hot Roll Mix! It’s super-easy, especially if you have a mixer. (The dough is kind of sticky.) Follow the directions on the box. If you want round sugar cakes, divide it between two 8″ or 9″ round pans. Proof it. Poke it. Top it with melted butter and cinnamon sugar (the more the merrier!). Then bake it! Your house will smell cinna-mazing! The cinnamon sugar collects in the dimples in the dough, and when you pour melted butter over it, it makes a salty-sweet cinnamon goo that is THE BEST THING EVER. Follow the directions on the box all the way through step 4. 5. Place the dough in a buttered bowl, turn to coat with butter, and cover. Let rise until doubled, about 1 hour. 6. Butter your baking pans. Divide the dough into two pieces if you are making rounds. Keep it in one if you are making a 13X9 pan. Lay it in the pan(s) and encourage it to cover the bottom(s). Cover and let rise for 30 minutes. Meanwhile, combine the brown sugar and cinnamon for the topping. 7. Melt the butter for the topping. Then dimple the dough with your fingers to create deep pockets. 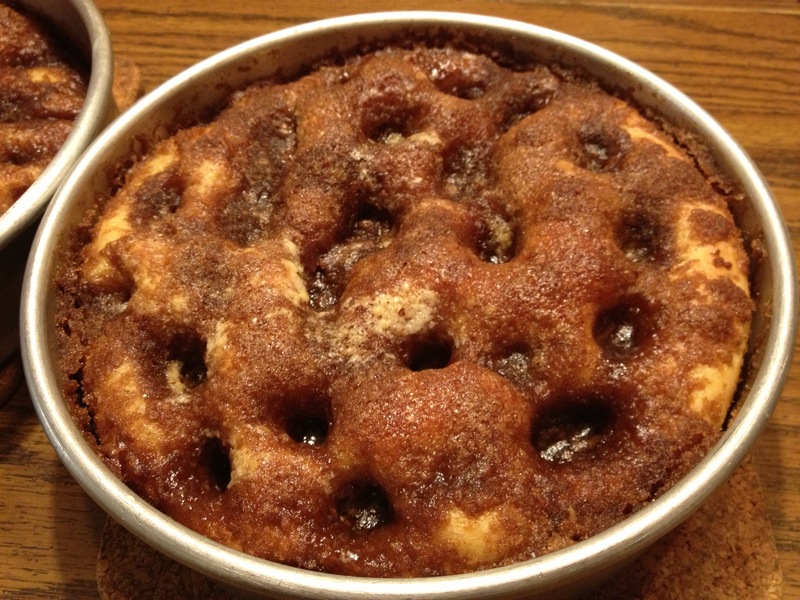 Spread the brown sugar and cinnamon topping over the top of each cake, then drizzle the melted butter over the topping. As it bakes, the butter and sugar will sink into the pockets, creating deliciousness! 8. Bake at 350 for 25-30 minutes, until it begins to get brown around any tiny edge that might not be covered by the topping. I tend to overbake them, and then complain about it, so watch them carefully. If your pans are shallow, place something beneath them to catch the drips. These cakes love to rise, and the topping might need somewhere to go. 9. Cool briefly and serve warm. Mmmm…Christmas!